TSC came highly recommended by a friend of mine. I hired them to install a two-unit AC system in a 54 year old home that I purchased a decade ago. I had a number of different quotes, but they were by far the most responsive to my needs. There were two rooms on either side of my house that were constant hotspots for the last 10 years. My office would regularly get to over 92 degrees in the summer while the rest of the house was in the upper seventies. My utility bill was over $600 in August 2009. TSC made sure to specifically address the hotspots by strategically placing registers exactly where they were needed – while maintaining maximum comfort in the rest of the home as well. The first utility bill came in, and I saved $80 this month alone, while enjoying true comfort for the first time in ten years. 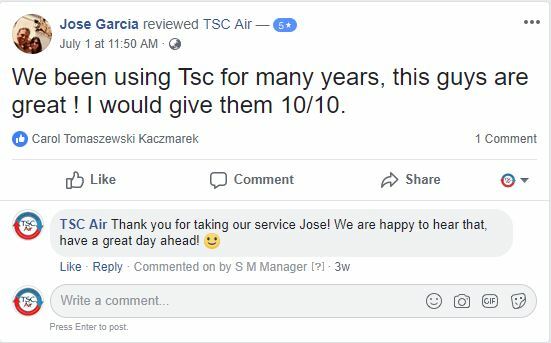 There were several other companies with comparable quotes, but TSC gave me confidence that they put customer satisfaction as their top priority. To back up their promises of customer satisfaction, they have decades of experience in the HVAC field. After installation, they had to come out to make an adjustment, but they were extremely friendly and they addressed the issue perfectly. 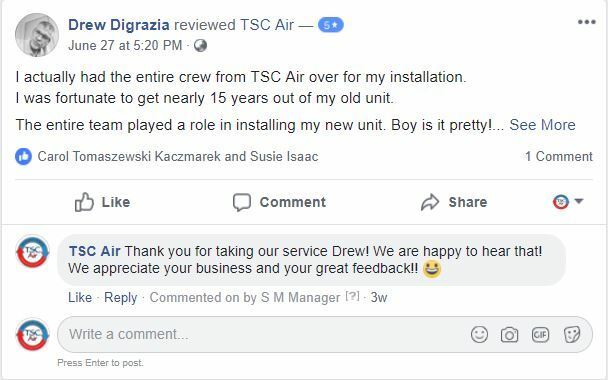 I would highly recommend TSC to anybody considering a new AC system, HVAC repairs, or seasonal maintenance. The gentleman from TSC helped us with our unit when it broke. The were very friendly and didn’t make us wait very long. I was extremly happy with their service and the cost was very reasonable. Thanks again to TSC and if you need someone reliable call them. They did what I needed without trying to ‘fabricate’ problems like some of these companies do. The work was done right the 1st time they worked on the problem. I have since told my friends about them and one has already called them and gotten the same results. …all HVAC companies had the kind of integrity, professionalism, and customer service attitude evinced by Don and his sons. 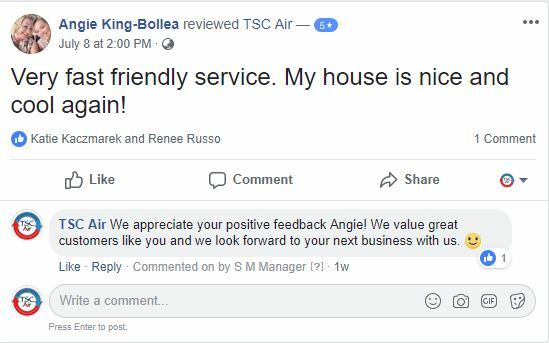 My neighbor told me about TSC after they bought an A/C unit from them, and they were really lavish in their praise. Turns out their praise was well-founded. TSC saved me a wad of cash not once, but twice now, within the space of a few weeks. Case 1: My A/C unit was in its death throes, and the electric bills were killing me. After consulting with TSC, we decided to go for it. They showed up when they said they would, removed the old unit, installed the new one, gave me all the paperwork, and had everything set up for me to get the rebate, just like that. Painless. Not only that, Don called a few days ago to inform me that he had done a bit of research and discovered that I was eligible for an extra $200 rebate from SRP. This was a few weeks after the install, and he gained *nothing* by taking the time to call and tell me about it, but he did it anyway, because that’s the type of guy he is. In today’s mail, I got the extra paperwork he promised, to allow me to get the SRP rebate. Case 2: A tenant called to tell us that the AC in their house had stopped working. My wife called a different company to take a look, and they informed us that the cooling coil had gone and that it would cost about $3k to fix, and we would be better off just replacing the whole A/C (for about $4200). Sounded a bit fishy to me, so I called Don, and he agreed to take a look (I called him ~ noon, and he was there by about 4 or so, SAME DAY!). Don couldn’t find any of the leaks the other company found, but did find the freon low, so he charged it up, and the tenant is now a happy camper. Original estimate to fix? $4200. Don’s final bill? About $250. Do the math. Bottom line? I have NEVER, EVER dealt with any plumber/electrician/HVAC/home contractor type that is as ethical, honest, and serious about his professional reputation as Don from TSC Mechanical. TSC will get my business exclusively from now on, as will anyone that they should recommend to me. 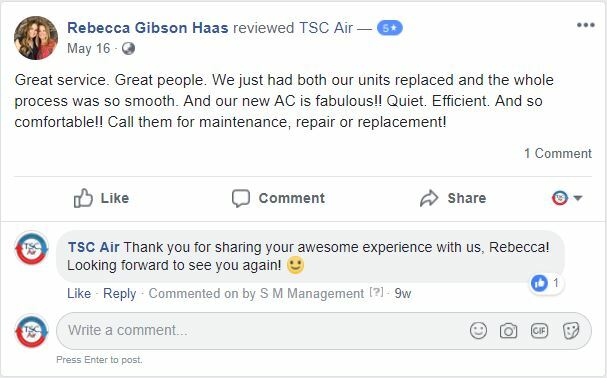 As a small business owner with the responsibility to care for my units A/C I was faced with one of my two A/C units not working and knew I had no choice but to get it repaired. I called one A/C repair company and was told that I needed to repair the unit for a cost of $3000 or get the unit replaced for nearly $5000. That left me to shop for bids. Two other companies came out and the story was much the same and then I got in touch with Don of TSC Air Conditioning. Thank God! He rescued me. 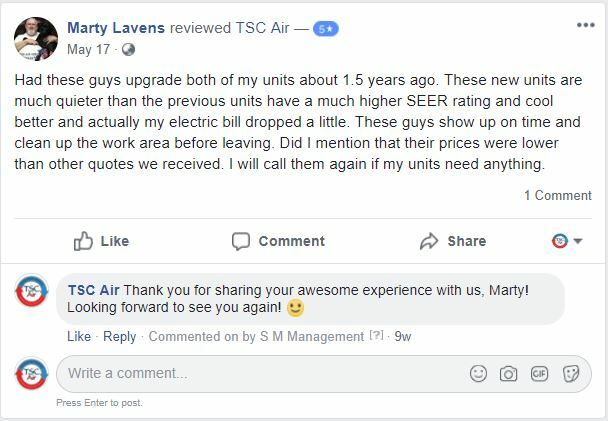 His extensive knowledge of air conditioning units, integrity, and honesty had him finding that there was a probelm with the unit, but a minor one that he was able to fix right then for a fraction of what three (3) other so called professional AC repair companies were trying to get from me. I also scheduled him to do the service on my two AC units and his charge was small, $170 and this included pad replacement. I have found my AC service and repair company and will tell anyone who needs this type of service to call, get your appointment and wait for them and them alone to do any of your AC work. I am completely satisified with their work and fully trust their word. My air conditioner broke about a week ago when it was 112 degrees. I got 3 estimates and TSC was far and away the best. A long story short, they fixed my a/c extrememly quickly and saved me some money. I am very pleased!